George W. Clark, a mortician turned developer, purchased fifty acres at the north Jacksonville suburb of Panama Park and around 1905 began extensive improvements. Homesites were first offered for sale on 1 January 1910. By 1915 population in the area had grown enough that a new school was needed. 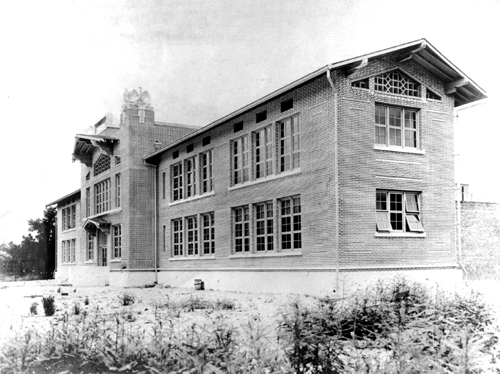 As part of a million-dollar bond issue that year, which provided for the construction of twenty new schools in the county, Klutho was chosen as architect for this school in Panama Park and another in East Jacksonville. This was one of his last great Prairie-style designs, with a facade that ranks among the most beautiful of Florida’s schools. The pattern of the buff-colored bricks produces an intricate texture. The entrance pavilion features geometric cast-stone grillwork and a prow-shaped canopy over the doors. 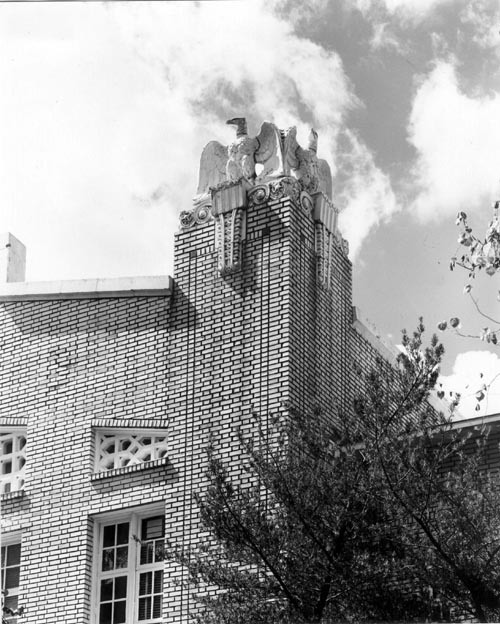 The building is highlighted by two central towers, which are surmounted by terra cotta eagles seated upon finely detailed “Kluthoesque” ornaments. Panama Park became part of the City of Jacksonville when the city limits were extended in 1931. The Panama Park Elementary School, known now as the Lola Culver Elementary School, still retains its Prairie School ornamental details inside and out, and it remains in use today. Archival photos courtesy of Robert C. Broward. Other photos by Wayne W. Wood and Judy Davis. 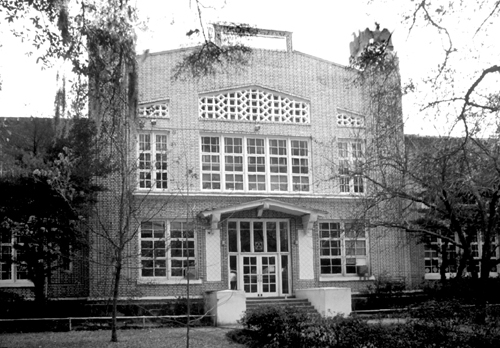 • Broward, Robert C.: The Architecture of Henry John Klutho: The Prairie School in Jacksonville. Jacksonville, Florida: The Jacksonville Historical Society, 2003. • Wood, Wayne W.: Jacksonville's Architectural Heritage: Landmarks for the Future. Gainesville, Florida: University Press of Florida, 1996.